St. Paul Lutheran, Tannersville seeks a part-time (10-15 hours per week) individual(s) to fill the choir director and accompanist roles. 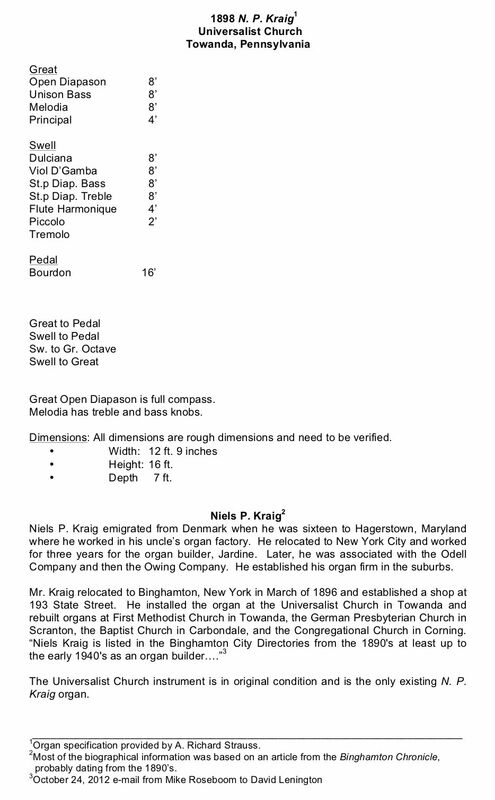 Versatility in playing the organ (2 manual Allen Digital Computer Organ), piano (Young Chang baby grand), and electric keyboard is desired. Two choirs (adult vocal and bells) provide musical leadership for one Sunday liturgical service (9:00 am) as well as evening Lenten services and weddings/funerals. First Sunday of the month is contemporary worship with praise band and may or may not request keyboard input, which would have separate compensation scale. Salary is commensurate with experience and level of musicianship. Please send resume and request for job descriptions to St. Paul Lutheran Church, attn. Personnel Committee, P. O. Box 196, Tannersville, PA 18372, or by e-mail: parishcoordinator@stpaultannersvillepa.org. 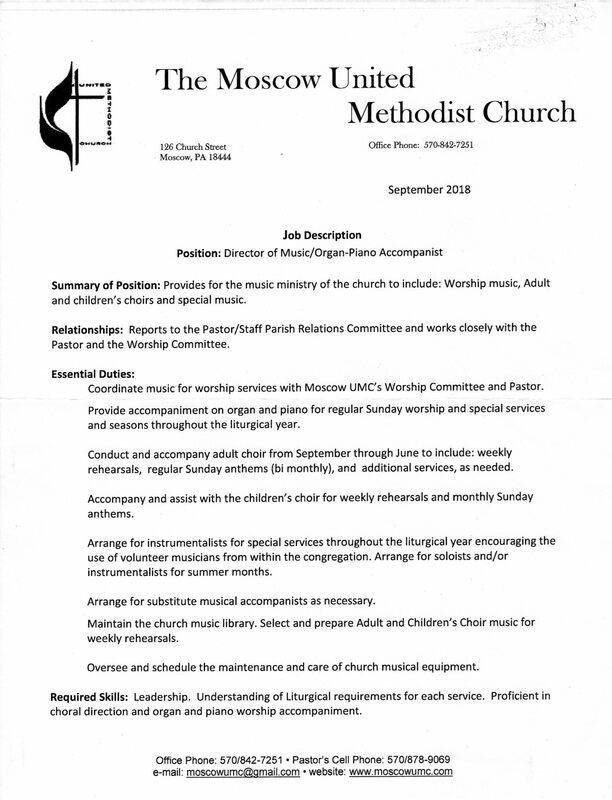 Moscow United Methodist Church is seeking a Director of Music/Organ- Piano Accompanist. Please see the job description below. Contact the church office at moscowumc@gmail.com or call 570-842-7251 for more information or to apply. The pipe organ has been called the “King of Instruments.” The sounds of the pipe organ have inspired worshippers for centuries. Great composers have written countless works for the instrument. Pipe organs have been installed in some of the world’s most prestigious concert halls and theaters. 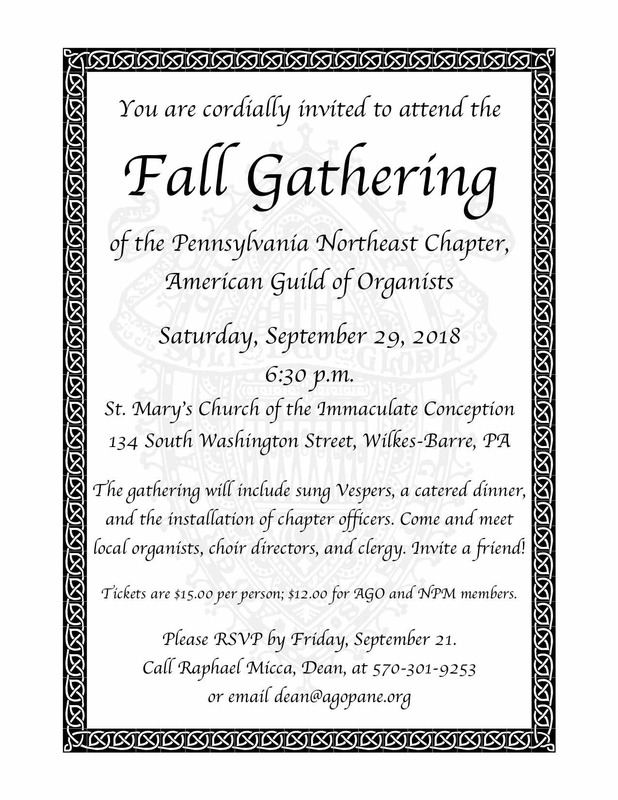 The American Guild of Organists is passionate about the pipe organ and we want to share our love with a new generation. 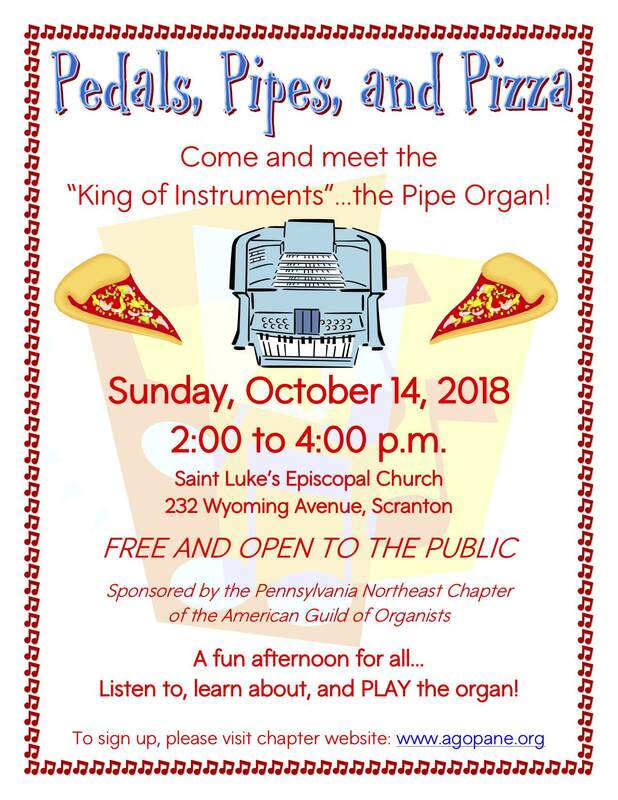 Join us on Sunday, October 14 at St. Luke’s Episcopal Church, Scranton from 2:00 to 4:00 p.m. for Pedals, Pipes, and Pizza. Participants will receive a behind the scenes tour of the instrument in addition to a chance to play it themselves (and eat some pizza!). All are welcome to attend. Students currently studying the piano are encouraged to bring a piece to play on the organ. CLICK HERE TO REGISTER FOR PEDALS, PIPES, AND PIZZA! 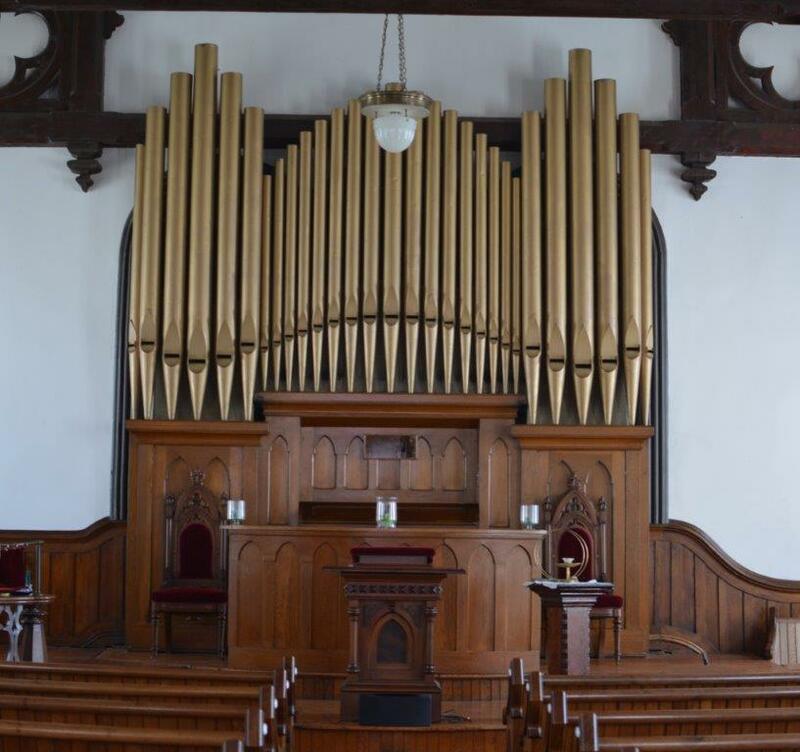 A 1898 N. P. Kraig tracker organ currently located in Towanda, PA is for sale. 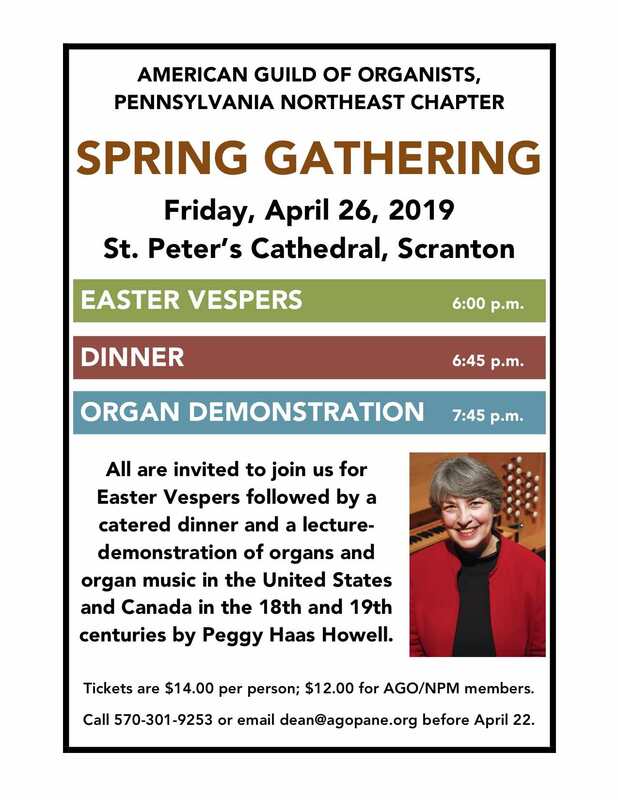 For more information on the instrument, please contact David Lenington at 570-268-5035.